Caston Inked is a highly-detailed textured serif typeface based on my previous font Caston, which was featured in a previous bundle. I wanted to have a set of handsomely ready-made textured serif fonts in my toolbox. 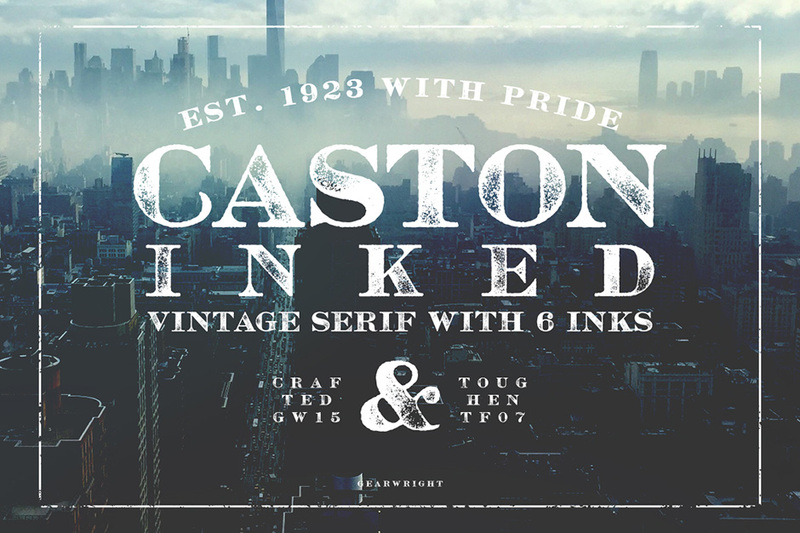 Made to mimic old inky printing works, Caston Inked was crafted to present an idea like a tradesman of integrity. This old school textured serif is an excellent (and a really handy) choice for retro creative projects, as well as hand lettering works. With Caston Inked you’ll be able to access each different inked letter easily. The texture is also highly detailed. • Caston Inked is a full cap typeface, consisting of 3 styles – light, medium, and heavy. • Uppercase and lowercase were inked differently. In total, each english alphabets has 6 textured options. • You will not find the same texture pattern recurring in the font. All textures were made freshly. File size is approx 1008.9KB (1.9MB unzipped), offered as a single download.